Welcome to part 4 in my 6-part series on making tomato soup with fresh tomatoes! Today’s recipe is for an Indian tomato soup which was an inspired by my travels in India many years ago. I was on an overnight bus trip somewhere in the middle of the desert in Gujarat, unable to sleep, sick as usual, when the bus pulled into some rundown shack of a roadside restaurant. Why we had to stop at 3 am for food, I had no idea. But I learned to not question things while in India. Or at least, not to outwardly express my daily frustration with confusing cultural customs (don’t even get me started on standing in “lines” at train stations). Not even hungry, I ordered some dal, a spiced lentil soup, just to get my mind off my misery. Sitting in a little plastic chair meant for a child, the customary street food seating arrangement in Asia, with dubious looking dogs skittering about, a few hanging light bulbs providing a faint eerie light in an otherwise pitch black night, I felt like I’d just arrived at the gates of Hell. The dal arrived and immediately it looked suspect. It had a dark muddy red hue, as opposed to some of the brighter yellow dals I’d had in other parts of India. It was also thicker, with hearty chunks of tomatoes and herbs, more like a stew than a soup. At this point in India, about two months into my travels, I’d grown accustomed to being disappointed by Indian food. I know that sounds certified CRAY-CRAY if you’ve ever been to India. I am the only person I know that reports this experience. Everybody I’ve ever met whose been to India raves about the food. EVERYBODY. But that was not my experience. Just being honest. This may sound double cray-cray but the main reason I didn’t like Indian food in India was that it just wasn’t flavorful enough for me. I know, weird! Perhaps it was that I was always comparing it to Thai and Burmese food, two cuisines I’d fallen in love with via recent trips. Perhaps it was the constant nagging stomach issues that prevented me from sampling the more adventurous and authentic places. Perhaps all the cafes and restaurants that catered to westerners learned to tone down the spices in their traditional dishes to cater to western tastes. 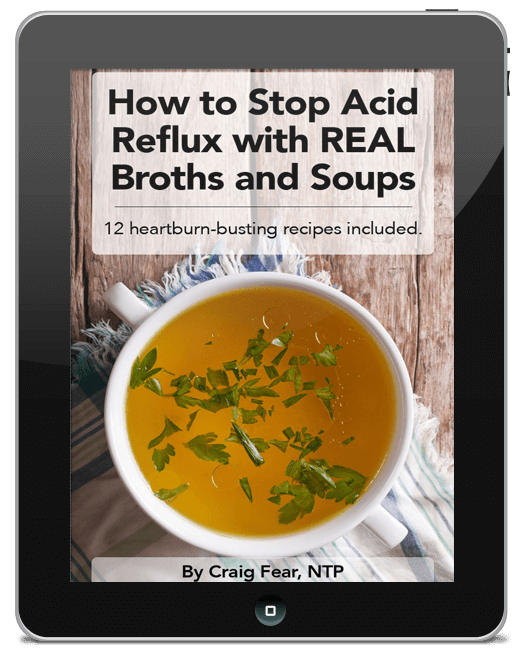 Perhaps it was all the bland food I was eating in the meditation centers I was frequenting. Perhaps it was that I spent all my time in northern India. Many people tell me the food is better in southern India. I don’t know! But everywhere I went, from Mumbai to Calcutta to Delhi and all the places in between, I craved more spices, more salt and more herbs in everything I ate. It’s the only country I’ve ever traveled to where I didn’t absolutely love the food. That dal in the middle of the Indian desert in a burned out roadside shack at 3 am. Finally, I thought, an AMAZING Indian food experience. It was just so packed with flavor. I couldn’t tell you what spices were in it but I can tell you there were A LOT of them, perfectly balanced, complex and rich. It was spicy but not light-your-mouth-on-fire spicy. And I never had another meal like it in my remaining time in India. Traveling can be weird like that sometimes. Sometimes things are not what you expect and those unexpected experiences become the most memorable. But I tell that story because when it comes to today’s Indian tomato soup recipe, I wanted to get as close to that dal experience as possible. And that was challenging because I’m not very knowledgeable about Indian cuisine. I find all the spices in Indian cuisine quite intimidating. There’s all those C letter spices – cardamon, cumin, cinnamon, cloves, coriander etc. and then things like mustard seed, nutmeg, garlic, ginger and turmeric all of which get combined in a million different ways. I looked at dozens of Indian tomato soup and other Indian soup recipes online and wrote down all of the spices that kept appearing over and over. Sometimes only a handful were used in a recipe. But in sticking with my “more is better” approach I decided to use all of them. Thus you’ll see quite a few spices in the recipe below. You don’t have to use all of them but I’d recommend using as many as you can. 1. Saute whole spices in ghee (or butter or oil) for a few minutes. 1. When preparing tomatoes it’s always best to peel and de-seed them as the skins and seeds can cause some digestive upset in some people. I know it’s another step but if you have time, it’s pretty simple. Check out my friends Margaret and James great short video, How to Peel and De-Seed a Tomato. 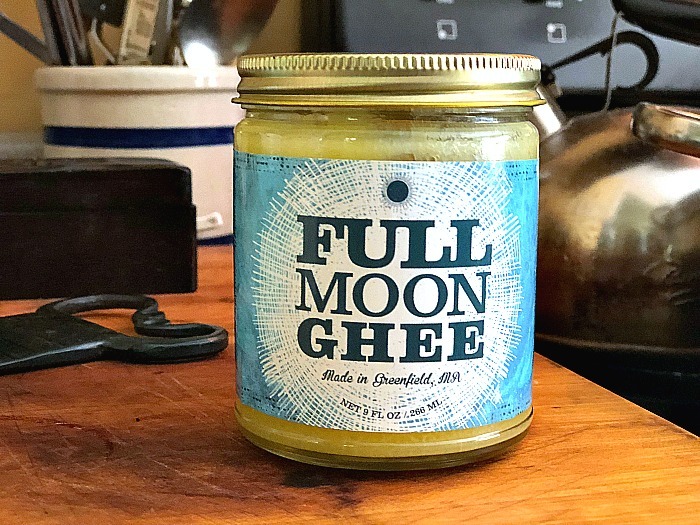 It’s made by my herbalist friend Hannah, who via her own trip to India, was inspired to create a line of ghee made in the traditional Indian manner. You can find it in local health food stores or order it online here. 3. Garam masala is a blend of Indian powdered spices with tons of variations. Most contain cumin, cardamom, cinnamon, coriander and chiles as a foundation. You can find prepared garam masalas in the spice section of most health food stores. It’s optional in the recipe below. Only add it if you feel the soup needs a little more flavor. 4. Raita is an Indian side dish made with yogurt, chopped cucumber and spices like cumin and cardamom. 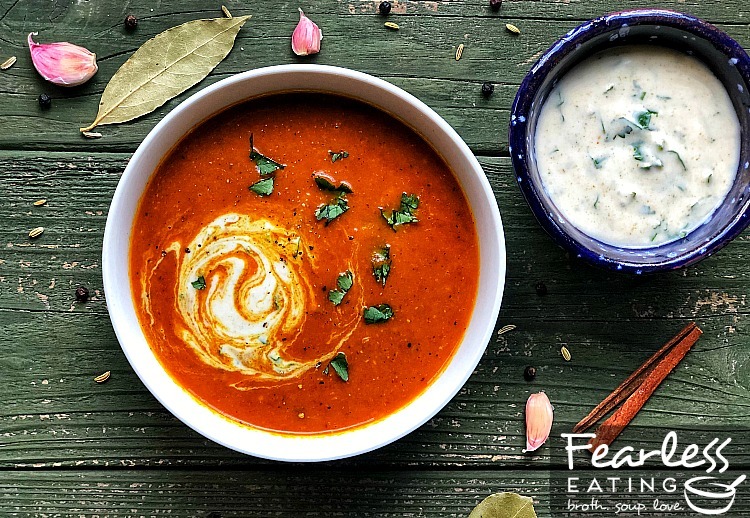 It’s a great complement to many Indian dishes and especially works well in this Indian tomato soup. 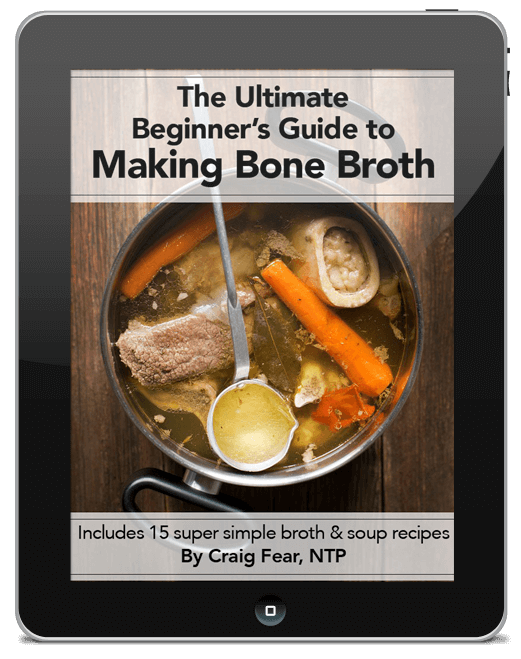 It only takes a few minutes to whip up. Highly recommended! 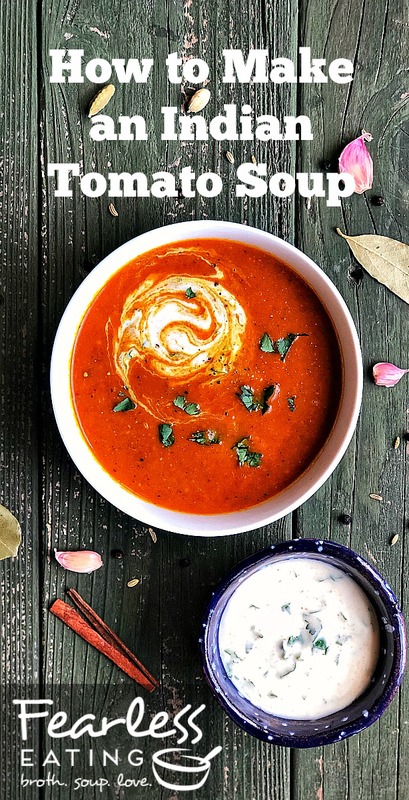 This Indian tomato soup is made with both whole and ground spices, tomaotes and broth and topped with a yogurt raita for a complex and ultra-flavorful soup. 2 pounds tomatoes, peeled and de-seeded plum, roma, plum, heirloom, vine, etc. Prepare tomatoes. It's always best to peel and de-seed them, if you have time. See link above for my friend's video demo for how to do this. It's easy! Chop roughly and set aside. Dice garlic, ginger and shallots (or onions) and set aside. Heat 1 TBSP ghee over medium heat in a stock pot. Add whole spices and saute for 1 minute, stirring frequently. Add garlic, ginger and onion and saute for about 5 minutes, stirring frequently, making sure they don't burn. Add tomatoes and chicken or vegetable broth, bring to a gentle boil and simmer for 10-15 minutes. Remove bay leaf and puree everything together with an immersion blender. Add powdered spices and stir for another 5 minutes. Taste and add more of the powdered spices, if desired. Turn off heat and prepare raita. Raita can be prepared a day ahead and refrigerated too. Ladle into individual bowls and add additional herbs, seasonings and raita, to taste. Parts 5-6 – Coming soon!